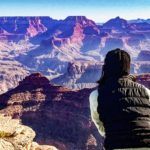 Well…maybe that’s an exaggeration but I did stop in the hotel room dressed and ready, backpack on, and question whether or not I should just head to Canyon Overlook Trail instead. Same views, easier hike, and less risk, right? Besides, I’m not entirely sure I’ve graduated from my “nonhiker” Patagonia days to “official hiker” just yet. 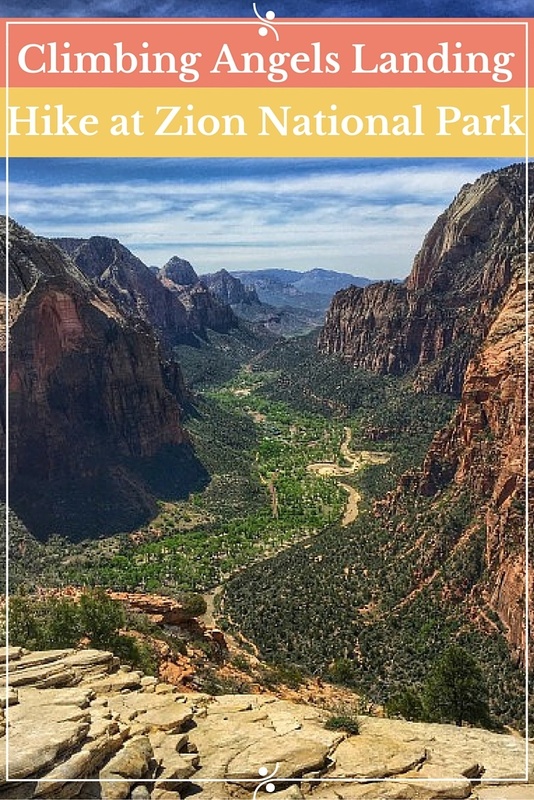 No, Angels Landing Hike is one of the top things to do in Zion National Park. Where on Earth did that self-doubt come from? After having some breakfast at the hotel, I took the Springdale shuttle to the Zion National Park entrance. From there, I took the Zion shuttle to stop #6, The Grotto. The day was sunny, clear, and comfortable 65-70 degrees. I was glad to get a somewhat earlyish start. I wanted to be done before the hottest part of the day and to avoid as much of the crowds as possible. The shuttle drops hikers off across the street from the trailhead. You’ll have to walk across the bridge spanning the Virgin River to begin. Angels Landing Hike climbs to a stunning panorama overlooking the river valley below surrounded by the towering rock of Zion Canyon. The hike is 2.4 miles one-way and takes about 4 hours to complete round trip. It’s a constant uphill climb, ascending bit by bit at first. You can see the gradually rising path snaking alongside the rock. I continued to wind along the rock as the trail became much steeper before briefly leveling out onto a flat pathway. The path changes to paved as the trail becomes steeper. 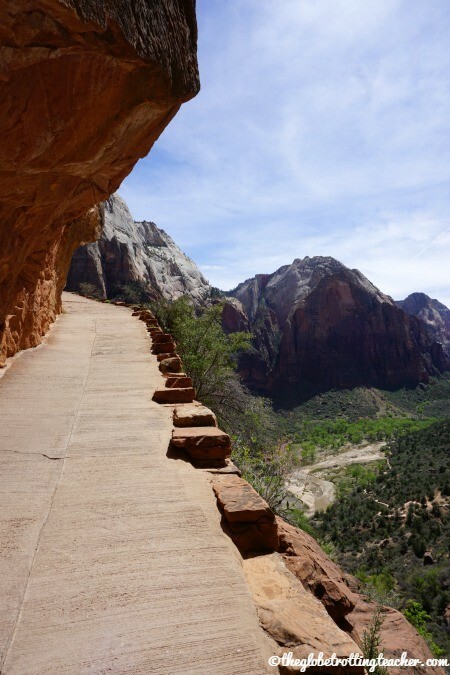 The paved pathway is a leg saver for the last bit up to Angels Landing! I stopped several times to catch my breath take photos, enjoy the surroundings, and relish in my progress thus far. Looking down at what I’d just climbed! There are very few shady places along the way and no bathroom or water facilities. Be prepared with plenty of water and sunscreen! I ended up giving a whole bottle of water to another hiker who was suffering from thirst because he had run out of water. At this point, you’ll make your way to the final set of 21 very steep, paved switchbacks up to Scouts Landing. The path is strenuous but clear and well-maintained. These switchbacks look a lot better from overhead than they do from the bottom! It’s an accomplishment to make it up these switchbacks to Scouts Landing, where many people choose to stop. You can sit along the rocky landing, have a picnic, take in the views, and rest before making the return trip. You’ll also be able to see a section of the last half mile to Angels Landing and the hikers on their way or returning. I stopped only to take some water, pack away my camera, and tie my shoes before continuing on to Angels Landing. This last half mile is a steep and narrow rock scramble with the drop to the canyon below always near on either side. The path is sandy and the rocks can be slippery. The placement of every step matters. 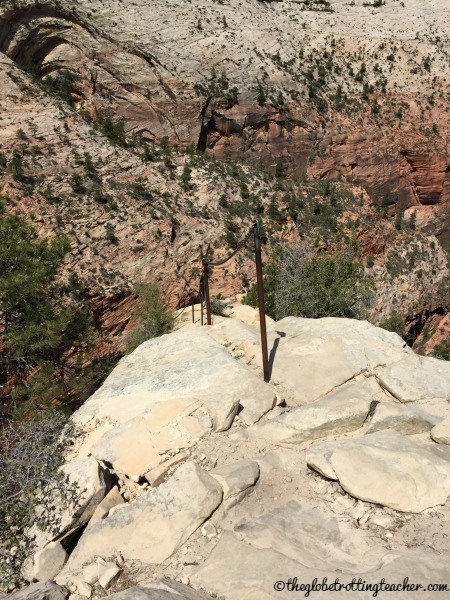 One of the more unobstructed sections of the climb up to Angels Landing. Careful on that sand. It makes the rocks slippery! There are chain links drilled into the rock intended to guide the way and also to act as a grip when necessary. I’ve read other blog posts and articles using phrases like if you choose to hold onto the chain links. My question is, “Why wouldn’t you use the chain links? !” You need to be able to steady your own footing along the path regardless of the chains or not, but when they were there, I found them more helpful than not. Chain links have been drilled into the rock in some places along the way. The trail is just a few feet wide in spots and hikers are both ascending and descending along the same path. The edge is always close by! At times, you need to stop and wait for others to pass by before moving ahead. The earlier in the morning you make the climb, the less crowded the pathway will be. The fewer people on the path makes it safer, too! As I waited my turn to continue, a man commented on my Walking Dead hat. No pun intended, right?! Next time, I’ll give more thought to the subliminal messages my hat gives off! Remember your elementary teachers who taught you to wait in line and be patient for your turn? 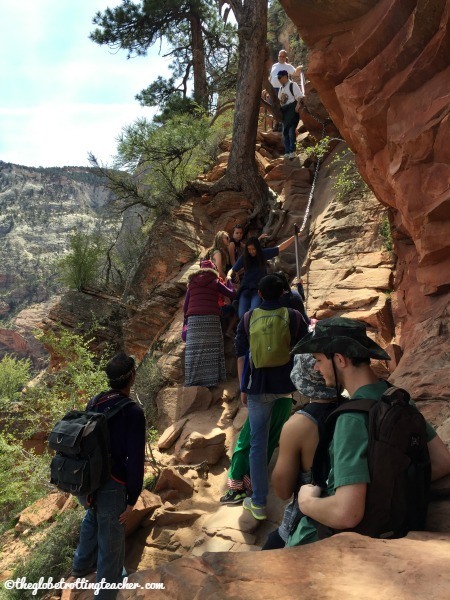 You need all those skills for Angels Landing Hike. 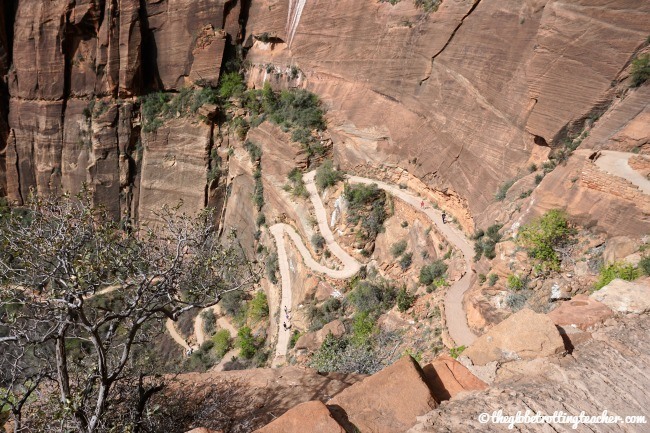 If you’re planning a climb to Angels Landing, keep in mind, it’s not for everyone. You should have at least a reasonable degree of physical stamina. 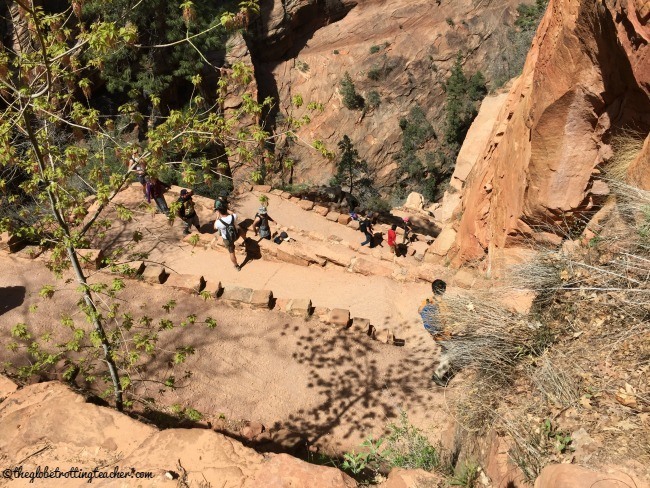 Do not do Angel’s Landing Hike if you’re afraid of heights. Plan to wear good gripping sneakers or hiking boots. No sandals or flip flops seems logical, right? How about no going barefoot?! Trust me, I wouldn’t have believed it if I hadn’t seen it with my own eyes! 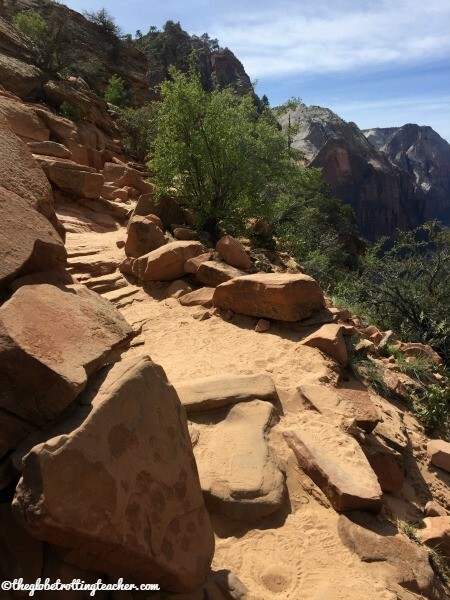 Be sure you have free use of both arms, as there are many times you’ll need your arms, hands, and legs to climb the rocky cliffs to Angels Landing. This means no backpack straps dangling, hair distractions, or a camera around your neck. The danger along the last half mile is real and safety should be your primary concern. Forgive me for a moment while my teacher side has its say. Parents, Angels Landing Hike is not for young children. Plenty of parents seemed to understand this and sensibly stopped at Scout’s Landing. But, I did watch as a family climbed with their daughter who couldn’t have been more than 4 or 5 years old. She needed to be hoisted from rock to rock and was perilously close to edge numerous times. Search Google for “Angels Landing falls” and you’ll come across a newspaper report in the Salt Lake Tribune about a young girl who was narrowly saved when she slipped, skidded toward the edge, and was grabbed by both legs by her father and a nearby man, who happened to be an off-duty police officer. 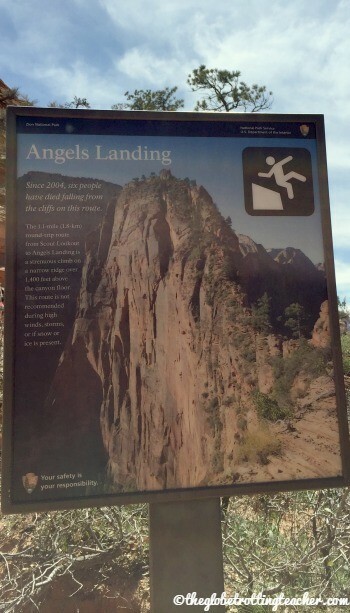 Please, do not do Angels Landing Hike with small children. The view from Angels Landing in Zion National Park, Utah. After a couple of hours of hiking and rock scrambling, I made it to the top of Angels Landing! Of course, it was worth it! What was that momentary blip of weakness back at the hotel? The hike was tough, but thrilling! The views were incredible. Sitting to enjoy my triumph, eating a few snacks and rehydrating, I decided it was official. I’ve graduated from nonhiker to hiker. Do you agree? This is Part 3 of my Zion National Park series. 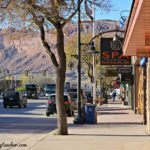 For Part 2, 8 Spectacular Things to do at Zion National Park, click here and for Part 1, What You Need to Know for a Successful Zion National Park Visit, click here. 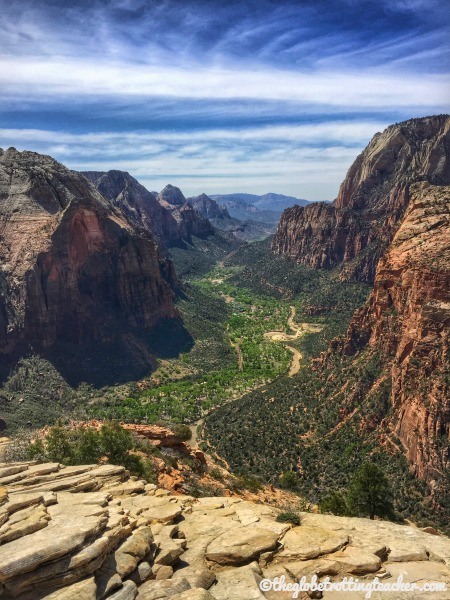 Would you do Angels Landing Hike? 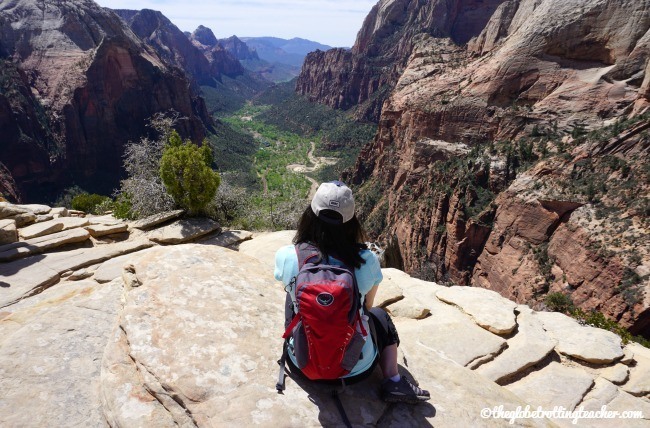 Have you already done Angels Landing Hike? What have I missed? Yes, you have graduated to full on hiker! Damn! That hike looks amazing! I can’t believe all those switchbacks, and you’re right, it doesn’t look like there is any shade at all. I can’t believe someone would hike that in flip flops! Barefoot I get, I have friends who hike barefoot because they feel “one with the earth” and are more stable with good gripping feet, but flip flops…no way! I have yet to visit Zion, but once I return to the US I would like to do some exploring of all the major parks in the country! 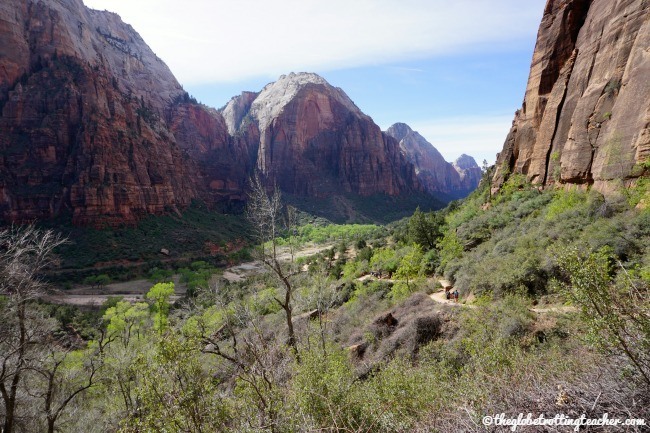 Zion and Angels Landing are gorgeous, Katie! I get the feeling one with the Earth thing, but we are talking sharp rocks! Doesn’t that hurt?! Hope you can make it to Zion soon! While I love Zion I don’t know if I could hike Angel’s Landing. The heights and sheer cliffs would make me pee my pants! This reminds me of the hike I did recently up Camelback Mountain just outside Scottsdale, Arizona. Only a bit less crowded – it looks like a fabulous place to trek. Well done, Jackie. Thanks, Carol! The key with Angels Landing is to go early to avoid the crowds. Too many people and the last half mile is crowded, slow, and less safe because so many people are on these narrow cliffs. I heard so many great things about Angel’s Landing. Seems like everyone has gone recently. I haven’t hiked in quite some time but I would most definitely go to this park in Utah. The views! It always amazes me what parents will do with their kid in parks. When I was there in February and the train was icy there was a kid no more than 4 going up the last half mile with his parents and they were so proud when he made it. The kid was barely tall enough to reach the chains. I was in shock over that one. One set of parents did win an award in my book. They had two girls around 10 doing the hike. The parents had them in harness and were clipped into the chains. They were doing in safely. OMG and I believe it, Jennifer! 4 years old is way too young and icy conditions would be unsafe for anyone! I think people feel safe in a National Park and forget how real the risk can be sometimes. I loved the Angel’s landing hike! Although I did want to turn back when we got to the switchbacks – but I am so glad we continued – the view from the top was incredible. My only regret that was I didn’t get to do the last part of the climb (with the chain) as it was too windy and wasn’t safe. But such a good climb – and I slept like a baby that night! Too bad, Vicki, but safety is first, right? Any kind of weather issue like the wind would not be good for that last bit up to Angels Landing. The view from Scouts Landing is still great! Hope you can make it back soon! Steep, but amazing. The hike looks quite challenging. What a great view as a reward 🙂 Well done! I’ve hiked 2 fourteeners in Colorado and that “edge” can be quite scary. Good for you. Wow… you’re photos made me nervous just looking at them, and I’m not usually afraid of heights. I love your disclaimer about small children… isn’t it dumbfounding the places some parents will bring their kids?! Thanks, Mags. I think there’s a false sense of security at National Parks because of their wholesome, family-friendly image. 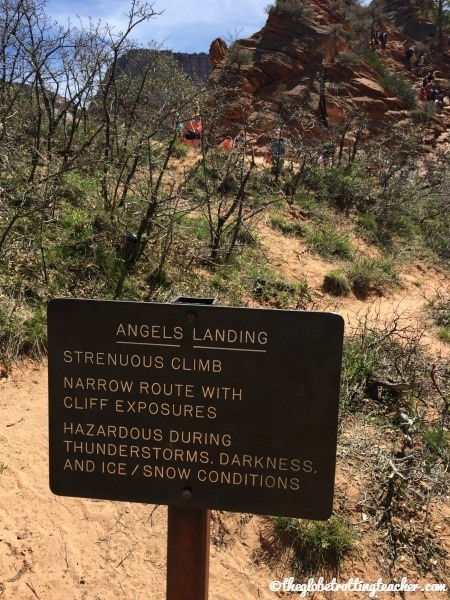 But, the danger is real on hikes like Angels Landing. I saw it also at Canyonlands NP, where parents allowed children to run and jump so close to the edge. It was all I could do to stop my teacher self from saying something! Love this hike. Great post. I did this hike about 3 years ago! I can’t believe i did it!!! At one point, literally, the only thing to hang on to was the chain and i saw this couple ROPE THEMSELVES TOGETHER! WHAT?! I had to literally hug them separately to get by. That was my scariest experience — nothing to break your fall except the valley floor 1,500 feet down. Ugh SUCH A GREAT HIKE THOUGH! I want to go back and do it again so bad! Thanks for reading and sharing, Brittany. That is crazy!! I can’t believe they roped themselves together! It’s such a tricky last bit and it shouldn’t be taken lightly. When I went there was a couple hiking it with a child who was no older than 5! I had to bite my teacher tongue so hard. 😮 Hope you can make it back to hike again. 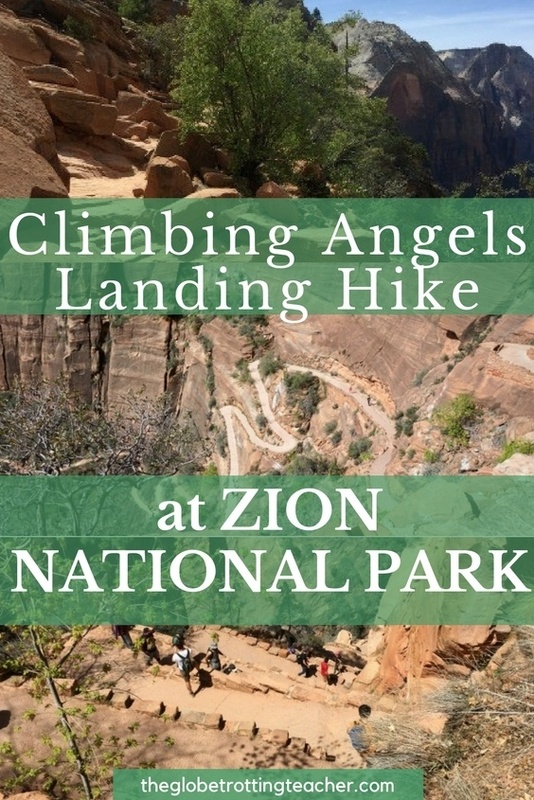 I’m headed to Zion NP next week and have been doing a lot of research on Angel’s Landing. I don’t think my friends and I expected it to be that strenuous, or dangerous of a hike, so I’m certainly grateful I’ve been doing my research prior to the trip. I’m not much of a hiker, but in good shape. I purchased 5 pairs of hiking sneakers and boots (obnoxious, I know, but I want to be prepared!) and I’m waiting for them to come in for me to see which pair will make the cut to come on the trip with me. I am afraid of heights, but I have a lot of determination that will likely trump my fears. Although, from the YouTube videos I’ve watched, I am second guessing that. I’ve decided I will make the final decision once we get to Scouts Lookout. Thanks for reading, Georgia. 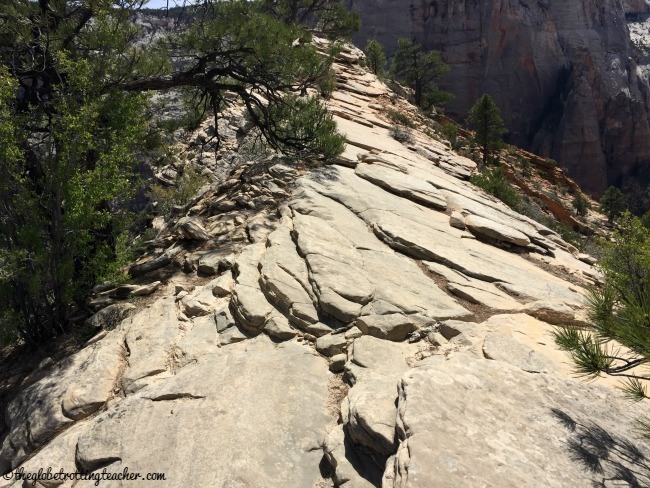 Angel’s Landing is an amazing hike but it’s so smart of you to do your research. The views from the top are gorgeous and definitely makes everything feel worth it. I was so glad I didn’t change my mind and choose an easier hike! A lot of people go to Scouts Lookout and not any further. 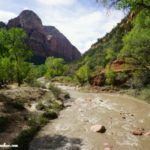 My best tip is to go as early as you can because there will be fewer people and you might feel better about the last bit up to Angel’s Landing without any crowding issues. Good luck and enjoy Zion! !